Alumni Ambassadors are integral to the success of LU. By sharing your time and talents in one, or many ways, you can help make a lasting impact on the Lawrence community. You can help us make a better Lawrence by assisting in Admissions recruitment, helping prepare current students for life after Lawrence, and keeping your fellow Lawrentians connected. Below are a few ways you can get involved. 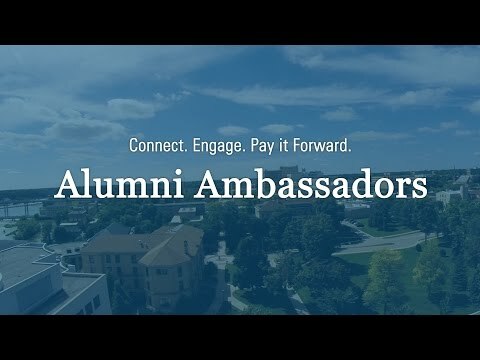 Sign up now to become an Alumni Ambassador. With your help, we can enhance the prospective student experience and support the Admissions Office in gathering more insight about each applicant. Interviews give us the opportunity to have a meaningful conversation with students and understand who is well-matched and ready to take advantage of the Lawrence experience. You get to select as few or as many prospective students as you'll have time to connect with and meet with them in your local area. Members of the Class Leadership Team serve as the principal communicators for the alumni they graduated with. The Class Leadership Team, launched in September 2016, encompasses Class Agents, Class Secretaries, Viking Gift Committee, Legacy Circle Gift Planning Chairs, and Reunion Committees. With the Class Leadership Team portal as a user friendly tool, you will have the opportunity to select tasks such as writing a fundraising letter, collecting and curating class notes, thanking classmates for their gift to Lawrence, thanking and promoting the Lawrence-Downer Legacy Circle, and encouraging attendance at events on campus or regionally. Lawrence University is invited to hundreds of college fairs each year, so we depend on our alumni to help cover college fairs across the country. We will provide you with all of the information you need (table banner, Admissions materials, FAQs, current facts & figures, etc.) to make sure you feel prepared to represent LU at a college fair in your area. Lawrentians are everywhere! Whether it's a social or networking event, a cultural event, or an opportunity to do some community service together, we'd love to connect you with other Lawrentians in your area. Regional Clubs are making a comeback and we'd love to know if you're interested in getting involved! Regional Clubs will be popping up in the Fox Cities, Milwaukee, Madison, the Twin Cities, D.C., and Chicago. If you live in another area and there is interest, there is an opportunity to start a club there as well! Time commitment: 15-20 hours a year plus attend both Reunion Weekend in June and Reunion Workshop in September. When: Year leading up to your Reunion Committees for each Reunion encourage participation in a class gift to the Lawrence Fund and attendance at reunion, as well as plan specific class related events for Reunion Weekend.